if you want google apps free without buying a web domain or if you want to host wordpress,drupal,phpbb for free?be happy because now you can do this using dreamhostapps. dreamhost launched dreamhostapps it's a totally free and provides following services. wordpress:free wordpress hosting and just one click installation .now its available with editable themes. 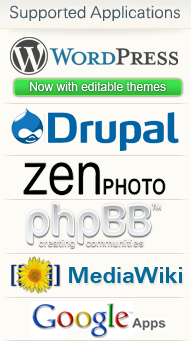 phpbb:you can create your own forums. google apps:provide google calender,google docs and GMail. step 4:install apps you want by just clicking install tab.and wait for 15 minutes and you have done.you can manage your apps using manage tab. dreamhostapps is free during beta period but if you signup now than you can use it for free forever. 1.The programs and software used such as PHP and MySQL are no average persons' languages and with the appreciation that virtually everybody wants and needs a website, the push and drive for easy web hosting results is very much called for. Whether cloud hosting is the appropriate hosting plan for your business depends on what exactly your requirements are! You can be an individual or a company, which will largely affect your decision.